All of us here at QE are officially stoked about this film, first and foremost because of Heath Ledger's role as the joker, but not because he died shortly after this was done filming, but because he looks right accurate. Christopher Nolan is again directing this installment, and also co-wrote it with brother Jonathan Nolan, David S. Goyer, and Bob Kane. Christian Bale is starring as Batman, and being that he's one of my favorite actors, I know this won't be cartoonish if the above list of names doesn't inspire confidence. Here's the summary: "Batman raises the stakes in his war on crime. With the help of Lieutenant Jim Gordon and District Attorney Harvey Dent, Batman sets out to dismantle the remaining criminal organizations that plague the city streets. The partnership proves to be effective, but they soon find themselves prey to a reign of chaos unleashed by a rising criminal mastermind known to the terrified citizens of Gotham as The Joker." The Dark Knight opens wide July 18th and a high-res version of the poster is after the break. This film is well worth the $$$ spent at the theater but I hope a screener leaks sometime soon to save you guys a bit of trouble. The flick lives up to all the hypes that were anticipated and Ledger is, no doubt, the absolute star of the film. The Joker character steals away the movie and shows you what chaos truely looks like. His one-liners will "PUT A SMILE ON THAT FACE" and his looks will make you wonder if it truely is Ledger under all that makeup. Bale is almost drowned out at times next to the Joker but he has his moments. 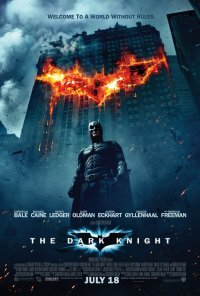 The Batman pulls no punches and shows that he is willing to do almost anything to save the city of Gotham and, the way better acted role of Rachel Dawes, Maggie Gyllenhaal. Eckhart is, as expected for me anyway, just as mezmerizing as the Joker is. His will and want to save Gotham from the things that go bump in the night is a wonderous battle he is confident he can win. What I, at least expected, was really wondering throughout the entire film is if they would bring in Two-Face after they brought in Harvey Dent. And, to ruin the surprise, they did!!!!!!! Two-Face is terrifying with his crispy coin and his six-shooter. His quest for revenge is aimless and his love for justice becomes horribly skewed. Caine, Freeman and,of course, Oldman have their moments and hold the fort down as Batman, The Joker, Harvey Dent and Two-Face duke it out. In the Quietearth website style: I would give this very long, two hours and forty minutes, and very fast paced film a seven out of a possible ten.